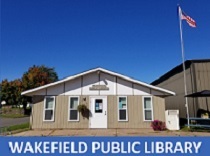 Members of the Wakefield Public Library can now download Audiobooks and eBooks from Great Lakes Digital Libraries! Just click the logo to go to the website to browse through the available titles. installment loans . If you have already decided to take Buy Generic Levitra, be sure to consult a doctor, you don't have any contraindications and act strictly due to a prescription.